Hey everyone, long time no posts from me! I’ve been busy in the background, don’t worry. Laying the foundations for some rad as hell new character models, they’re going to be great. But! This week I’ve been working as a concept artist. We already have a few natural props in the world that you can get resources from - some big chunky plants scattered around, the er, ‘natural crystal’ block that’s never actually had a proper mesh and probably doesn’t drop anything, and… well, that’s it. Until now! 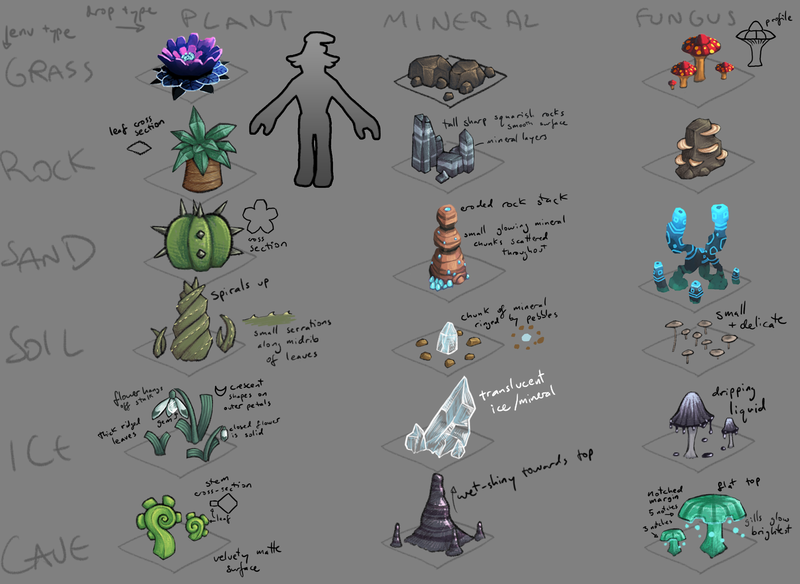 I’ve drawn up some designs for props to dress our world with, making the landscape look a bit more varied and giving you more ways to acquire useful crafting resources like leaves and petals, minerals, and fungus. Oh, and I need to credit @Minyi for the grass/flower, sand/mineral, grass/fungus and sand/fungus concepts as she made the originals of those and I just fiddled with them a bit. As you can see I’ve made kind of a grid here of different environments versus the different resource types, so you’ll be more likely to find those giant snowdrop plants in icy areas to gather their leaves and petals, but in sandy regions you’ll come across cacti instead. Cacti have leaves too… kinda! I’ll be starting on modelling these soon, so you’ll be seeing them in game before long! Oh cool. These look great! Will these miniral ones be harvested? And will they give stuff like iron maybe or…? And somehow England once again beat us on having the more poetic name. Oh, it all looks stunning, can’t wait. I should point out then that these plants will not be able to be transplanted - once you ‘break’ them you’ll get crafting items, not the whole plant. The little decorative flowers are for decoration, these are for harvesting. @PharaohNai - These are all harvestable! They won’t give metal ores, the items that they will drop are not available in the game yet. Oh that’s great, will they be used for important crafting recipes in the future or only decorative purposes? Every time I turn around this game gets more and more beautiful. It’s these little details that make the game so interesting. That you for such great art! I love the cave mushrooms, they should be bouncy so they help you reach higher spots in caves without grapples :D. Ok Ok this about the art here i know x3. Looks great so far but i wait for the 3D Models :D.
So these plants drop materials, not themselves… could we please have a skill that allows us a chance to get a seed to drop as well? I would love to be able to transplant these as well, even if it is a small drop chance. I don’t know much about recipes personally but I know that at least some of these items will have a use beyond just making decorative things. @Havok40k - I like the idea of dropping seeds, but I’m not sure if that’s part of the plan right now - @olliepurkiss? Maybe something for the farming system later on? Alternatively, maybe allow the them to be transportable (so they could still be used decoratively) and just make it so you have to extract (or other machinery depending on the complexity of the resource) or even just hand-crafted into the usable resources - much the same way as trunks can currently be turned into timber. It’s on the todo list. Likely as a forged enhancement to equipment. 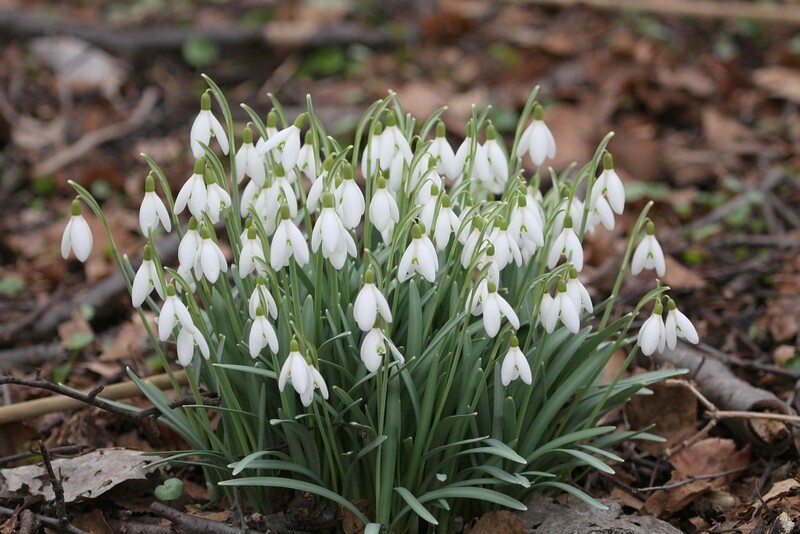 Snowdrops in sweden to, flowering now.